This post may contain affiliate links. This means if you purchase through a link on my site, I may receive a small commission at no cost to you. 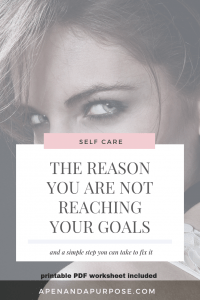 As I think about the big goals you have for yourself, I can’t help but worry that you are sabotaging yourself without even realizing it. So many people go through their days on autopilot and don’t even notice how they get in their own way. Our brains are constantly thinking, constantly jabbering at us. If you stop and listen to the thoughts that go through your head, you might be shocked, especially if you stop to ask yourself whether you would ever say those things to another person. Who is this mean girl? We rip on ourselves all day long! And you know what’s a bummer? If you hear something enough…you really start to believe it. Heck, some of those things you’ve been saying to yourself aren’t even coming from you! They’re things you’ve heard others say or things you assume they think about you. You just keep on repeating them. In a recent blog post, I discussed how I was playing a video game and came upon an obstacle and said out loud to myself “I’m too stupid to do this.” WHAT???? That was mean. The good thing about that situation was I said it out loud so it wasn’t an invisible negative thought I just let slip by making me feel bad. Instead I was jarred and had to look at what I was saying to myself. Part of living life with intention is noticing these thoughts and then STOP IT. The first step though is to notice them, which isn’t easy. They are automatic. We do it without consciously thinking, without noticing. But we need to step up and notice so we stop hurting ourselves. Next time you feel discouraged or down, take out your journal and write everything you notice going on in your mind. Doesn’t matter how mean, just get it down on paper. Actually do this a few times in the next week so you can see some patterns. What are the things you are saying about or to yourself? Do they reflect some kind of fear? Are they your thoughts or are they coming from a voice from your past? Do you believe these thoughts? What would your best friend or spouse say if they heard you saying these things to yourself? What would you say to your best friend if she was saying those things to herself? When you start noticing these thoughts and how problematic they are, it gives you a place to start…a place to move away from. A direction to get out of your own way. Marlena is the blogger behind apenandapurpose.com, where she writes about using journaling for self improvement and reaching goals in life and business. Using her experience as a Licensed Psychologist with a Master’s in Business, she teaches people how to break through negative thoughts and fear to do what matters. For more about me read my about page.